Arrive in Riverhead, New York and meet up with your local guide to tour Long Island's North Fork. Stop for lunch on your own in the charming town of Greenport. Enjoy rural scenery as you drive through Long Island's North For, the agricultural region, where vineyards and farm stands flourish. Tour Baiting Hollow Farm Vineyard, a family owned grower of exceptional wines, and a horse rescue sanctuary. Tour the facility and hear stories about these beautiful horses, followed by a tasting of the Vineyards distinctive wines! Check into the Hyatt place in Riverhead, and freshen up for a fabulous included dinner with scenic water views at the East End's Famous Jerry & The Mermaid. Enjoy a hearty continental breakfast at the Hyatt before meeting your local guide for a driving tour of the neighborhoods and villages on Long Island's South Fork, including "The Hamptons" - the summer playground of the rich and famous. Famous residents include Jerry Seinfeld, Madonna, Calvin Klein, the Hiltons, Steven Spielberg, Kelly Ripa, Paul McCartney and more! View the homes, neighborhoods and towns where the rich and famous relax and socialize, make a photo stop at Coopers Beach, on the list of the top 10 Beaches in the United States! Enjoy a quaint lunch on your own in the village of Southhampton. After lunch touring continues in Montauk. Drive past the oldest ranch in America! The beautiful seascapes and rolling dunes lure summer residents. Stop to tour Montauk Lighthouse, the oldest lighthouse in New York. Passengers can climb the 137 steps to the top of the tower, explore the exhibits in the "keeper's house" museum, shop in the gift shop and walk the grounds for fantastic fall foliage views! Touring continues to Sag Harbor, a truly international town, and one of the busiest ports in the northeast. Dinner will be served (tentatively) at Il Capuccino before retiring for the evening back to the Hyatt. Awake to a hearty continental breakfast at your leisure. Check out of the Hyatt and depart to Westbury, NY. Arrive at Old Westbury Gardens & Phipps Estate for a guided tour of the magnificent mansion and the formal gardens. Enjoy lunch on your own at the Old Westbury Diner, prior for departing to return to Pennsylvania. 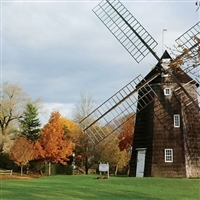 Deluxe Motorcoach Transportation, two nights lodging at Hyatt Place - Riverhead, NY, two extensive continental breakfasts, two dinners, admissions to Old Westbury Gardens & Phipps Estate, Baiting Hollow Farm & Vineyard, Montauk Lighthouse, Guided touring of South Fork (Hamptons, Montauk & Sag Harbor) and North Fork.